As some of you may know, I'm a sucker when it comes to old books. Point me to a second-hand bookshop and I'll happily spend hours there scanning through all the titles. 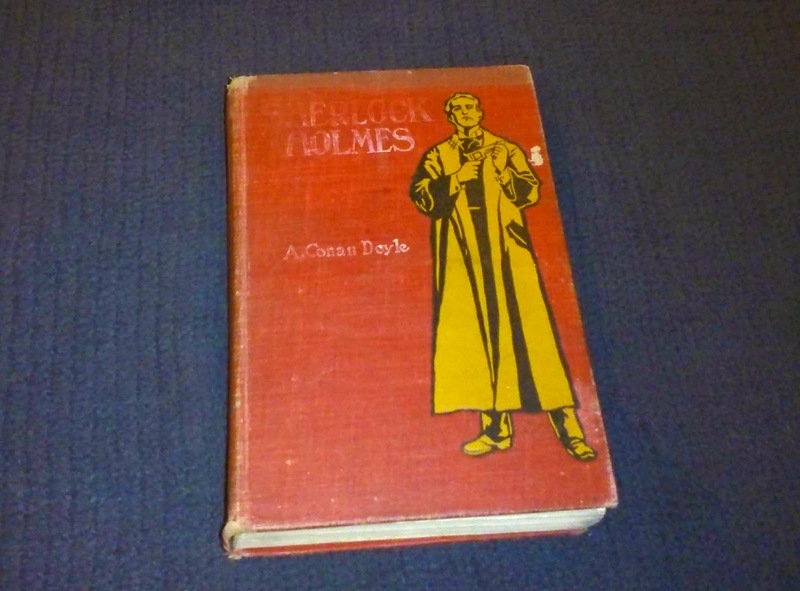 A large chunk of my Sherlock Holmes / Conan Doyle collection is made up of books from around the 1950s (books I purchased way back in the 90s when the Murder One bookstore was still going strong on Charing Cross Road). However, barring a handful of Strand Magazines (the cheaper, non Sherlock Holmes ones) I didn't really have anything that old in my collection - that is until this fine volume arrived in the post last week. 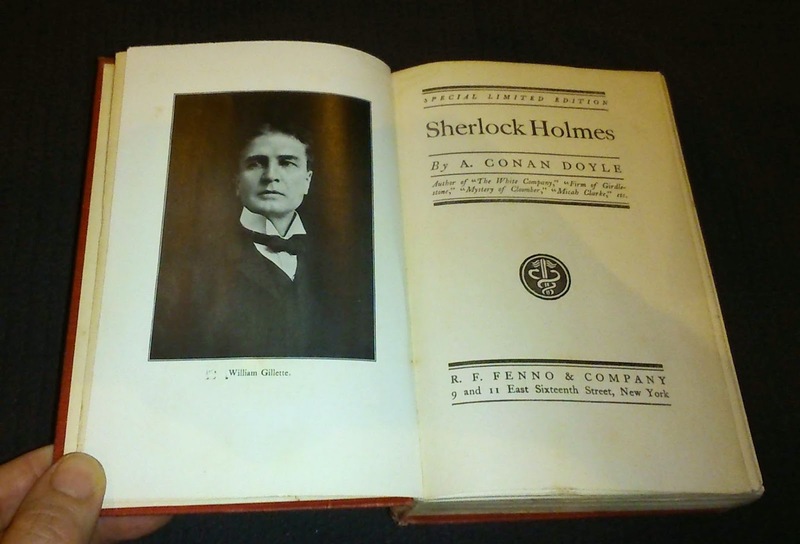 Printed in 1900 by R.F. 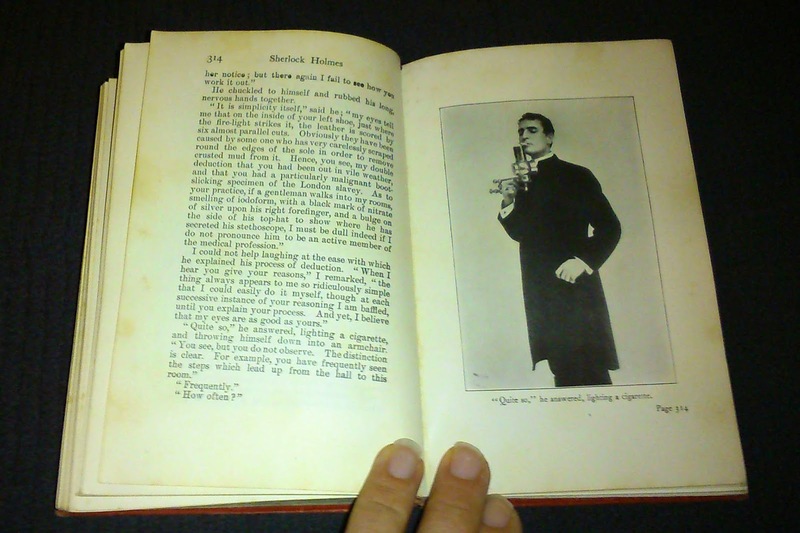 Fenno & Co. of New York, this edition of 'A Study in Scarlet' is interspersed with lovely photographs of William Gillette as Holmes (publicity photos taken to promote Gillette's play 'Sherlock Holmes: A Drama in Four Acts' which made its Broadway debut the previous year). An added bonus came when I turned to the back of the book and found 'The Sign of Four', 'A Scandal in Bohemia', 'A Case of Identity' and 'The Boscombe Valley Mystery' nestled snugly at the rear (I was only expecting 'Scarlet'). All I need now is to stumble upon a copy of the 1887 Beeton's Christmas Annual at a local charity shop (hope springs eternal).